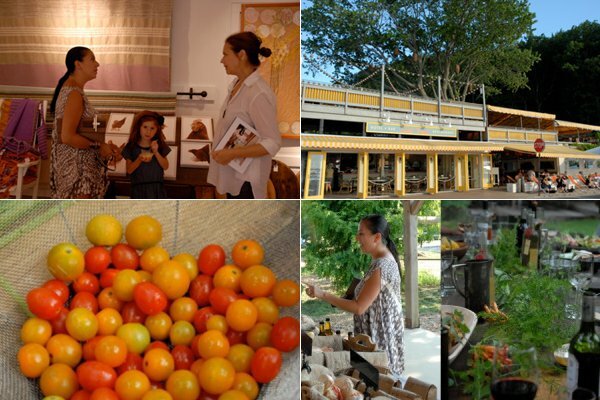 The typical Shelter Island Saturday involves hopping around farmers markets, taking in some culture, inviting friends over for lunch, and lazing by the pool. Contemporary artist Sylvia Hommert, a Shelter Island local, shows us the ropes. SHELTER ISLAND, New York – On Saturday mornings I look forward to heading straight out to the Sylvester Manor Farm Stand. My family is part of their CSA, and we enjoy picking up our share while we visit with friends doing the same. Then we head to the Historical Society Farm Stand to round out the grocery list. We usually go to Reddings Market to pick up a fresh, made-on-site green juice, before going home to make a wonderful brunch. The house is always full of guests, especially in the summer, so it's really lively. Once we're stuffed, we're horizontal by the pool for a while. If there are still errands to run, I make them much more fun by driving my convertible. During the summer there are plenty of cultural events to choose from. Art fairs, gallery openings, concerts, charity events — Saturdays are always filled to the brim with things to do and we try to pack it all in. Usually we start with some art — perhaps at Boltax Gallery or Nova's Ark sculpture fields in Bridgehampton — followed by a dinner party with friends at home. This is almost always followed with late-night dancing at Sunset Beach. See Sylvia Hommert's portfolio of work. Sylvia is an artist whose focus is on light and its interactions with different environments. Her work has been featured in galleries around the world, and she recently participated in Beijing's Red Gate art residency. She travels for the experience of new settings and understanding of different cultures.